songs together for Perry’s new album. Christopher “Tricky” Stewart has been one of the top hitmakers in the music business for the past decade. Starting in 1999 with the Top 5 pop hit “Who Dat” for JT Money and in 2000 with the #2 hit “Case Of The Ex” for Mya, Stewart has created a long string of hits. 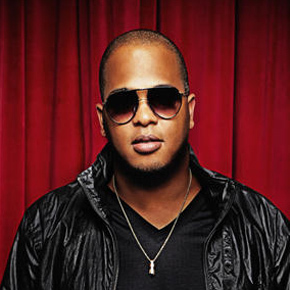 He has co-written and produced some of the biggest contemporary singles, including the #1 hit “Umbrella” for Rihanna and the #1 “Single Ladies (Put A Ring On It)” for Beyonce. Stewart also is CEO of his company, Redzone Entertainment, which consists of Redzone Records (distributed by Island/Def Jam), plus a production and publishing company. Impressively, Stewart has won two of the top Grammy awards (Song Of The Year and R&B Song Of The Year) for “Single Ladies (Put A Ring On It)”. He has also received Grammy nominations on several other occasions, most notably for “Umbrella” (Record Of The Year and Song Of The Year). Here’s a rundown of Stewart’s other big hits: “Baby” and “One Time” (Justin Bieber); “Hard” (Rihanna); “Touch My Body” and “Obsessed” (Mariah Carey); “Leavin'” (Jesse McCartney); “Throw It In The Bag” (Fabolous); “Just Fine” (Mary J. Blige); “Ride” (Ciara); “Me Against The Music” (Britney Spears); “Suffocate” (J. Holiday); “I Luv Your Girl” and “Falsetto” (The-Dream); “Just Like Me” (Jamie Foxx); “Gangsta Luv” (Snoop Dogg); and “I Look To You” (Whitney Houston). Stewart was born in Markham, Illinois (a suburb of Chicago), where he grew up in a family music environment. Both of his parents were music directors, and he was mentored by his older brother, Laney. Stewart eventually moved to Los Angeles, where he had the opportunity to be mentored by Louil Silas Jr., a top label/A&R exec for MCA Records. Then in 1995, Stewart decided to relocate to Atlanta to launch Redzone Entertainment with his brother, Mark (who is President of the company). 2010 has been another terrific year for Stewart. He has had recent hits with Justin Bieber and Rihanna, and he co-wrote several songs for Christina Aguilera’s album Bionic, and for Ciara’s upcoming album, Basic Instinct. In addition, Stewart is excited about the three songs he wrote with pop superstar Katy Perry, which will be featured on her highly-anticipated new album, Teenage Dream. We’re pleased to present this special Q&A interview with C. Tricky Stewart. He discusses his career and hits, and offers insights into the hitmaking process. DK: What was your first big break, that helped establish your career? Stewart: Being introduced to Louil Silas Jr. (a top exec who worked with Bobby Brown, New Edition, Jody Watley and Chante Moore) was my first big break. My brother Laney introduced me to Louil, and I wrote & produced cuts for his artists. This was my first big break, in terms of how I got in the door of the music business. My first hit single was “Who Dat” by (rapper) JT Money (in 1999). But I really didn’t take full advantage of having this hit, because I was more of a R&B producer than a hip-hop producer at the time. DK: You’ve written and produced big hits for over a decade. But was it “Umbrella” that took your career to a whole new level? Stewart: I think “Umbrella” was a hit that helped me become more successful and led to getting more work. But more importantly, I learned how to play and write at a higher level. It was then that I learned what it takes to be hitmaker. After “Umbrella” I had the track record to connect with many artists and labels. But I learned that the competition is really yourself. Artists and label execs now wanted me to deliver a special hit like “Umbrella” or “Single Ladies” everytime out. I had to work hard to keep writing songs that were up to this level. DK: How did you co-write “Umbrella”? Stewart: I wrote it with The-Dream (aka Terius Nash) and Kuk Harrell. We were freestyling and we had a drum loop running. Dream was in the vocal booth – he started to write (and sing) the song in a freestyle way. Then we wrote it together – Kuk helped me with the music. It came together quickly. DK: How do you write with The-Dream? Stewart: Dream is my main writing partner. The way we work is unorthodox. We record everything that we do in the studio. Once we start hearing melodies and tracks that we like, it starts to come together. DK: Besides The-Dream, do you have any other regular writing partners? Stewart: It’s mainly Dream that I write with, but I’ve been working more with Ester Dean. Her material has really developed. Ester is signed to my publishing company. DK: Tell me about your company Redzone Entertainment. Are you looking to discover and sign artists? Stewart: Redzone is our overall company – it’s a production company, and we have Redzone Records, which is distributed by Island/Def Jam. We’ve signed two artists that we’re excited about: Bryan J and Lonny Breaux. DK: You just had the big hit “Baby” with Justin Bieber. How did you write this song? Stewart: Dream and I wrote the song “One Time” for Justin’s first album, My World. Then we wrote “Baby” for his My World 2.0 album. Dream jotted out the idea and we came up with the music, and the record sounded like a smash. (Singer/writer/actress) Christina Milian, who is Dream’s wife, also co-wrote this song. C. Tricky Stewart with Christina Aguilera. DK: It seems that many current hits feature a guest rap performance. These days, do you think about adding a rap part early in the writing process? Stewart: We generally write the song first without having a rap in mind. We write the song from start to finish. Then if we think the song would work well with a rap, we approach the song with a rapper. Then we work together with the rapper, to make sure it sounds like one cohesive thing. I think [the trend of having pop songs with rap] for radio or club records, is something people want to hear. Music is now spread into many genres – people want a little bit of everything with their music. I like how the elements of rapping or spoken hip-hop is incorporated into mainstream music. DK: What artist projects are you currently working on? Did you work on Katy Perry’s new album? Stewart: I did three songs with Katy Perry – I’m really excited about her album project. I’m hearing people who say that this could be the album of the year – it’s really good. We did three songs together – there’s a song called “Hummingbird Heartbeat” that I really like. We just got into the studio and made records the old school way. DK: What advice would you give to young writers and singers who are trying to break into the business? Stewart: They have to put themselves in the position to be discovered. Sometimes young writers are scared of getting their song stolen. Singers should get to producers, A&R execs and good managers – people who can help to connect the dots and make it happen. They need to find the points of entry into the business, and connect with the right people. DK: What are some of the goals that you still want to accomplish? Stewart: I want to accomplish what Quincy Jones and L.A. Reid did – not just producing hit records, but building a record label and breaking artists. I want to be known for breaking a couple of global stars. My quest for Redzone Entertainment is to be known for developing and breaking artists. I’m excited about the two artists that we’ve signed to Redzone – our artist Bryan J is coming with a single in October. Bryan has a young fun sound, and he also has great ballads. We’re aso setting things up to break Lonny Breaux. Lonny is an incredible talent – he’s a hip-hop child who’s soulful, and he has a lot of intellect. He really touches people with his music.